‘I grew up in Trinidad & Tobago and came to the UK in 1965 to study in Hull, before moving to the capital. London in the late 1960s and early 1970s was pretty exciting, particularly for someone who had been living in Yorkshire! It was the centre of everything: you were able to meet everybody here. That was crucial. This was the psychedelic ’60s, and we were engaged with the avant-garde. For me, being a black man in London at that time meant being immersed in the counterculture, which had a strong link with black culture. We took our drive from what was happening in the USA: for instance, the ‘Black Is Beautiful’ movement. The West Indian Students Centre in Earl’s Court was a key focal point at the time. It was there that I encountered some of my major influences, like the Caribbean Artists Movement, which was set up by writers such as Andrew Salkey and John La Rose. As young students they had almost a celebrity status for us: we were emboldened by them, as well as by the politics of people such as the radical activist Michael X. My emphasis has always been on culture and the arts, as well as local politics. I wanted, always, to give access to people’s voices. In 1969 I set up a theatre group, Black Arts Workshop, which was an opportunity for young people to say important things through verse, performance and dance. Later, in the ’80s, I worked with the Greater London Council as principal race relations advisor. But if I had to choose the thing I am most proud of, it would definitely be setting up UK Black History Month in October 1987 with Akyaaba Addai-Sebo. I never thought it would catch on, but it spread all over the country. 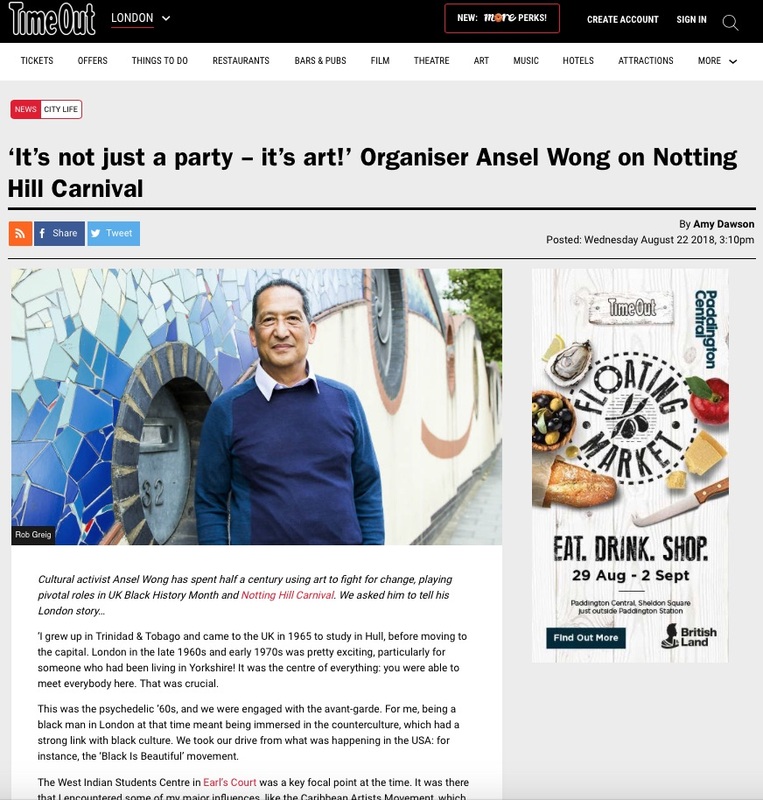 Notting Hill Carnival has been a huge part of my life in London: I haven’t missed a single one since 1978. My involvement started at the Elimu Youth and Community Centre on Harrow Road, where we were working with young people who were playing truant and not achieving in school. We decided to put together a mas band to take part in Carnival in 1981. We had no money for costumes, so we bought T-shirts and stencilled them using shaving brushes. From there we became better and better, and started to get really noted. The Elimu Carnival Band has performed every year since, and we’ve gone into schools to teach black history and black art. I’ve also served in the past as chair of the Carnival Board, and I now chair the advisory council of Notting Hill Carnival Ltd, organisers of this year’s event. I have a very distinctive approach to Carnival, which is not always shared. I think we have lost the creative edge. In the last ten years, Carnival has moved away from creativity and artistic presentation towards personal enjoyment. NHCL is committed to staging a spectacular Carnival where the emphasis is on the music, the dance, the costumes. It’s not just a street party – it’s street art!